Call it a last-minute clarification or a June surprise, another piece of bad news: A trailer bill that the Legislature will vote on Wednesday permits districts to slash the school year by an additional three weeks for the next two years, if voters reject Gov. Brown’s tax increase in November. That’s twice what Gov. Jerry Brown seemed to suggest in the May budget revise when he proposed the elimination of 15 days divided over a two-year period. Instead, the Legislature is prepared to authorize a 160-day year, likely the lowest in the nation and far behind other advanced nations; nearly all states have a 180-day year, which California also required before 2010. In one sense, nothing has changed. Brown hasn’t suggested less funding for schools than the $53.6 billion for 2012-13 that the Legislature approved in passing the budget last week. Districts will have to negotiate a shorter year with their unions; they can’t declare it unilaterally, and most districts won’t go that low. But the language in AB 1476 (section 50, midway through a very long bill) is a stark message that a defeat of the tax increase will create more than a one-year revenue crisis for schools. Brown basically spared K-12 schools cuts in this year’s state budget but is promising to slash school funding by $5.5 billion if voters reject the income tax/sales tax increase. 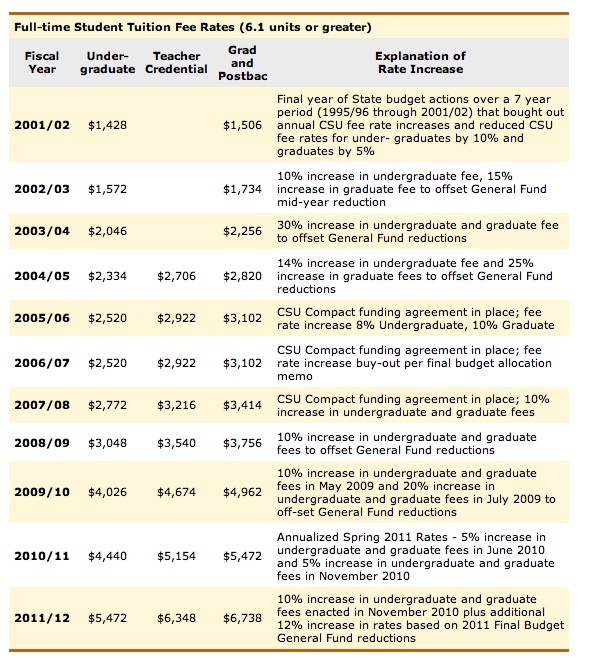 That translates to $441 per student, about an 8.4 percent cut in funding. Eliminating 15 days out of a minimum 175 days would be an 8.6 percent cut in the calendar. So cutting 7.5 days each of the next two years would solve only half of the gap, leaving districts to make other cuts through layoffs, benefits, or non-pay areas. Lowering the minimum year to 160 days now would be too late for those districts and unions that already have negotiated potential cuts. Sacramento City Unified teachers earlier this month approved a two-day furlough, plus an additional 10 days, lowering the school year to 168 days, if the tax initiative fails. A Senate staff member said that the intent of the trailer bill language is to give districts more flexibility to cope with terrible choices. Most districts won’t go to a 160-day year, but it will be an option. Because districts must submit balanced budgets for two years beyond the current year, districts can negotiate with certainty for continued furloughs through 2013-14. The governor approved the trailer bill language, which clears up any ambiguous reading of his earlier proposals, the staff member said. But Robert Miyashiro, vice president of the education consulting firm School Services of California, said that the Legislature shaped the budget the way it is, so it is disingenuous to say, It is out of our hands. Legislators strategically set it up to say the schools must take a big cut if the initiative flops. A spokesman for the California Teachers Association said that the union had not read the trailer bill language and could not comment. The trailer bill also contains language permitting teachers and other school employees to accrue a full year of vesting for pensions if a district’s school year drops to as few as 160 days. John Fensterwald co-authored this article. The Legislature’s budget package is missing many of Gov. Brown’s controversial education initiatives. A joint Senate and Assembly plan outlined yesterday protects transitional kindergarten, the science mandate, and the AVID program, rejects the weighted student funding formula, and offers districts a choice in how they’re paid for state mandates. “This budget protects and invests in public education this year, and increases Proposition 98 funding by $17 billion over the next four years,” said Assembly Speaker John A. Pérez during a press conference Wednesday morning with Senate President pro Tem Darrell Steinberg. The overall budget plan that lawmakers will vote on this Friday would erase California’s $20 billion structural deficit, balance the budget for each of the next three years, and create a $2 billion reserve by fiscal year 2015-16, according to Pérez and Steinberg. 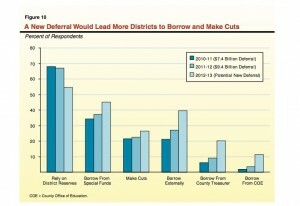 Spending for K-12 education would be $53.6 billion for the 2012-13 fiscal year. That’s about $1 billion more than the governor had anticipated. Because the budget assumes more revenue for education through the passage of Brown’s tax initiative in November, the state is obligated under Proposition 98 to start paying off the “maintenance factor,” the IOUs given to schools during bad times. But if the tax increase fails, the Legislature and governor are in accord on the need for cuts of $5.5 billion for K-12 schools and community colleges. That would translate to a K-12 cut of $450 per student. In addition, the legislative package would include trailer bill language allowing K-12 schools to cut 15 additional days from the next two school years. The governor’s biggest loss, for now, is the weighted student funding formula. Lawmakers’ refusal to include it in the budget isn’t an outright rejection of the concept of a simpler, fairer finance system that sends more money to districts with high proportions of English learners and indigent students. And Brown is expected to bring up the issue again this summer. But many lawmakers felt that the governor was jamming them to accept sweeping changes without justifying the basis for his formula, while legislators from suburban districts called for restoring all of the money lost to cuts over the past four years before redistributing new money. Brown had proposed eliminating the mandate for more than two dozen K-12 programs, including (the most expensive) requiring schools to offer a second year of high school science. Dropping a mandate would mean that districts could continue offering a program by finding money in their existing budgets. Brown also proposed reimbursing districts a flat $28 per student for the remaining mandated programs. Science teachers and the business community protested that the state shouldn’t retreat from its commitment to science education (see commentary on this page), and the Legislature agreed, keeping it and all of the current mandates intact. However, lawmakers didn’t increase the reimbursement rate either, so districts can expect to continue accumulating a big IOU for meeting the science mandate. The state has also gone to court, arguing that the $250 million cost on the books for offering a second year of science is way too high, based on a false assumption that high schools had to add a period to the day to accommodate it, according to Paul Golaszewski, an analyst with the Legislative Analyst’s Office. Applying for a straight $28 per student would be the easiest, quickest way for districts to be reimbursed for mandated costs. However, the Legislature also would continue to allow districts to submit bills detailing the cost of complying with mandates – and hope that the state accepts the claims. The joint budget proposal allowed the early childhood education community to exhale a bit, by denying a number of significant cuts that the governor was seeking. He wanted to cut the reimbursement to preschool providers by 10 percent, raise the financial eligibility requirement, place a two-year cap on families receiving childcare services while attending a school or a job-training program, and eliminate full-day preschool starting next year. This is the second of a two-part series on adult education in California. Click here to read part 1. The report, aptly titled At Risk: Adult Schools in California, surveyed the state’s 30 largest school districts and found that 23 had made significant cuts to their adult education programs. In many cases, they lost at least half their funding. One of them, Anaheim Union High School District, shuttered its 73-year-old adult school. Adult ed cuts in 30 largest districts. 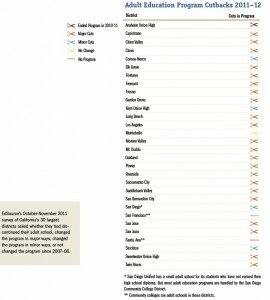 (Source: EdSource) Click to enlarge. These draconian cuts have taken place in just the past three years. Until 2009, adult education funding was protected as a categorical program, meaning districts could not use the money for any other purpose. But that February, faced with a massive budget shortfall, the Legislature and Gov. Brown removed 39 programs – including adult ed – from this restriction and gave school districts flexibility to use the funds wherever they were most needed. A survey of several hundred school districts conducted by the adult education program in Montebello Unified School District found that about 40 have closed or are planning to shut their adult education programs, and estimated that, statewide, districts have redirected about 60 percent of the $773 million in adult education funds to the K-12 system. At the same time, enrollment dropped from 1.2 million students to about 700,000. “We were actually growing before the cuts started,” said Pam Garramone, principal of Sonoma Valley Adult School, which closes at the end of this month. Garramone said there were six adult school agencies in Sonoma County before flex started; now there’s only one, Petaluma, and it doesn’t have the capacity to accommodate the 10,000 people who have been shut out. Farewell message on Sonoma Valley Adult School site. (click to enlarge). She blames the Legislature. Adult education should never have been flexed, said Garramone. Even though categorical flex is supposed to end on June 30, 2015, few people expect to see the money again. Indeed, Gov. Brown’s proposal for a weighted student funding formula would make categorical flexibility permanent. MetroED’s enrollment plunged from 10,000 to 2,000 after it closed more than 50 programs, two major campuses, and all its community outreach centers except for a program for disabled adults. The adult education program in Oakland Unified School District was among the hardest hit without being closed. It has been cut by more than 90 percent since the start of flex, losing $11 million of a $12 million budget which necessitated shutting two campuses and canceling English as a second language courses as well as its high school credit recovery program. The GED classes are still thriving, however, and graduated 95 students last year. 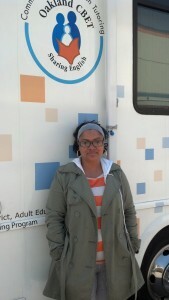 Donita McKay standing outside the Oakland adult ed computer literacy RV. (Click to enlarge). Donita McKay is studying for her GED and taking a computer literacy course through Oakland’s adult education school. McKay is 49 years old, a single mom with four children, and a ninth-grade drop out. She said being back in school has opened her mind and given her a different outlook on life. Oakland has all the challenges of any big city. 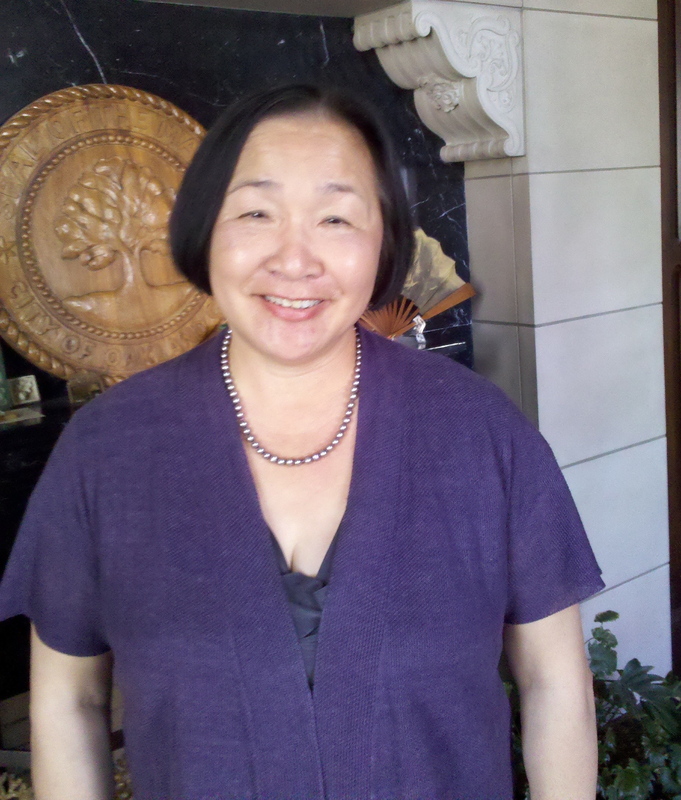 English is not the first language for about 40 percent of the population and in some neighborhoods the high school dropout rate is a staggering 60 to 70 percent, said Mayor Jean Quan, who spent twelve years on the local school board. Oakland Mayor Jean Quan (Click to enlarge). It’s a critical goal, but one that doesn’t have critical support. Although adult education programs are run by both K-12 school districts and community colleges, it’s not the core mission of either. So, it’s taken some time for advocates to organize, but they’ve started considering alternatives on a number of fronts. Gordon Jackson, Director of Adult Education Division, CA Dept. of Education. (Source: CDE). are facing their own massive budget cuts. And a third plan, already underway, is to lobby the Legislature to remove adult education from categorical flex and from the governor’s weighted student funding formula. Four Republican legislators crossed party lines in the Assembly on Wednesday, providing the two-thirds vote needed to approve a bill that would create a middle class scholarship program for the state’s public college and university students. AB 1501 is part of a two-bill package called the Middle Class Scholarship Act introduced by Assembly speaker John A. Pérez, a Los Angeles Democrat, that would reduce tuition by two-thirds for students attending the University of California and California State University whose families earn less than $150,000 a year. In urging a yes vote, Pérez cited the enormous fee hikes at the state’s public colleges and universities, noting that in the past decade tuition has increased by 191 percent at Cal State, by 145 percent at the University of California, and by 300 percent at community colleges. Meanwhile, state support for UC and CSU has dropped by 21 percent and 26 percent respectively since 2005. 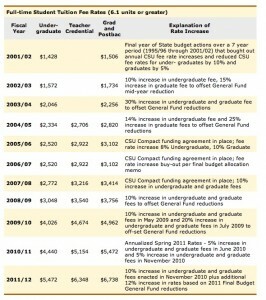 Ten-year history of changes in CSU tuition. (Source: California State University.) Click to enlarge. Student loan debt now exceeds $1 trillion nationally, more than all U.S. credit card debt. Statewide, according to the California Student Aid Commission, there’s been a double-digit increase every year for the past three years in the number of students who qualify for loans and for the state’s Cal Grant awards. Under AB 1501, eligible Cal State students would save $4,000 per year, or $16,000 over four years, while UC students would save about $8,200 per year, or nearly $33,000 over a four-year period. Students from families earning between $150,000 and $160,000 a year would be entitled to assistance at a lower level; their scholarships would be reduced by 10 percent for each $1,000 in family income over $150,000. California community colleges would receive $150 million to help students defray the cost of textbooks and offset other educational expenses. Modesto Assemblymember Kristin Olsen, vice chair of the Higher Education Committee and one of the Republicans who broke ranks and supported the measure, defended her position during the floor debate as a vote for the state’s economic prosperity. She noted that wealthy families can afford to pay tuition, and low-income families have various options for state and federal aid, but middle-income families are being hit hard by escalating tuition and the faltering economy. While there is some disagreement among Republicans on AB 1501, they are united in their opposition to its companion bill, AB 1500. This is the half that pays for the Middle Class Scholarship Act. Pérez wants to fund it by closing a loophole in the 2009 Corporation Tax Law that gave companies operating in both California and another state the option of computing their taxes using either the Single Sales Factor (SSF), which is based on their California sales, or another formula that gives the companies more flexibility on how much taxes they’ll pay. The policy was adopted in one of those never-well-thought-through budget deals reached in the middle of the night. Requiring those companies to move to the SSF would increase the state’s general fund by about $1 billion in 2013-14, according to the Legislative Analyst’s Office. In fact, the LAO recommended that the state take that action two years ago. Gov. Brown tried to change the law last year, by getting bipartisan support for AB 40X. The bill would have mandated the SSF and returned the revenue to businesses in the form of job credits as an incentive for hiring Californians. Although it passed the Assembly, the bill did not garner any GOP support in the Senate and died. One of the sponsors of AB 40X was Assembly Republican Cameron Smyth of Santa Clarita. He’s also one of the four Republicans who voted yesterday for AB 1501. But in a phone call Wednesday afternoon, Smyth said he will not be supporting AB 1500. Kristin Olsen and the other two Republicans who voted for AB 1501 – Katcho Achadjian from San Luis Obispo and Jeff Gorell of Camarillo – have also said they will not support the companion bill, but are willing to work with Speaker Pérez on finding a different funding source, such as savings from the governor’s pension reform proposal. More California school districts than ever before are heading toward insolvency. The State Department of Education’s Second Interim Status Report for 2011-12, released yesterday, named 188 districts with serious financial problems; of those, 12 have negative certifications, meaning they won’t be able to meet payroll and other bills for this academic year. California schools that may not be able to make ends meet. (Source: State Dept. of Education) Click to enlarge. It’s a steep increase over the first interim report, released last February, which we wrote about here. At that time, there were seven districts on the negative list and 120 in qualified status. With the increases, more than 2.6 million of California’s 6.2 million school children attend schools facing uncertain financial futures. Given the years of budget cuts to education, the new numbers didn’t come as a surprise to school finance officials, said Mike Hulsizer, head of governmental affairs for the Kern County Office of Education. But it will get worse if neither of the school tax initiatives passes next November. “There is no question that this understates the risk that districts are facing,” said Hulsizer, because many of the districts counted on funds from Gov. Jerry Brown’s tax increase in planning their 2012-13 budgets. Joel Montero, CEO of the state’s Fiscal Crisis Management and Assistance Team (FCMAT), told a state Assembly committee two weeks ago that small and rural districts face the largest impact from another round of midyear cuts. “Small and tiny rural districts don’t really have an economy of scale,” said Montero. They don’t have enough money or students to absorb any additional losses, particularly when those losses come in the form of deferrals, the $9 billion-plus that the state owes to school districts. Options for school districts that have run out of options. (Source: Leg. Analyst) Click to enlarge. “So the decision that you have to make as a school district is whether or not you can afford to fund that deferral for the term and if you can’t then it becomes a cut for you in a way,” Montero explained to subcommittee members. Five of the nine districts that received a negative certification fall into the small and/or rural category. The tiniest, La Grange Elementary School District in Stanislaus County, will be shutting down at the end of this school year and sending its six students to other districts. Two of the districts, Vallejo City Unified and South Monterey Joint Union High School, have already been bailed out by the state and are under a state-appointed administrator. Linda Grundhoffer, the Chief Business Official in South Monterey – formerly King City Joint Union High School District – said ever since the district went under state control in 2009 the onslaught of budget cuts “are just making it harder for this district to recover.” The district is seeking to lower the interest rate on its state loan from 5.44 percent to 1 percent through legislation, but so far Senate bill 1240 and Assembly bill 1858 are on the suspense files in the appropriations committees of their respective houses. In an unusual twist, this year’s negative list also contains a small but very wealthy district. At a little over $170,000, the median household income in the San Mateo County foothills community of Portola Valley is nearly three times the state average. But the district is now trying to stave off a state takeover after an audit found a shortfall of about $850,000 for this school year plus an additional half-million dollars allegedly misappropriated by the former superintendent, who’s already facing felony charges stemming from his tenure as chief financial officer in the neighboring Woodside Elementary District. One hundred years ago last month, the cry “women and children first” echoed on the decks of the ill-fated Titanic. A century later, the ship carrying California’s future is listing in the water. However, it seems that today no one is willing to make a sacrifice: It’s every man, woman, and child for himself or herself. California was once the envy of the country — beautiful beaches, good jobs, a booming economy, and the promise of the best public education system, including top-notch, affordable state colleges and universities. However, the economic seas became rough in 2007 with the impact of the recession. In an effort to keep California afloat, our leaders in Sacramento — unable or unwilling to right the ship by raising revenue — scrambled for items to dump overboard. The value of education plummeted as other budget items were given priority, and education funding became the primary target for cuts, suffering a disproportionate loss of revenue. From 2007-08 to 2010-11, K-12 education funding sustained 54 percent of the loss of revenue, although it represented approximately 40 percent of the General Fund. In contrast, corrections sustained just a 4 percent loss, despite representing approximately 10 percent of the General Fund. As the recession persists, the captain and crew – Gov. Brown and the legislators – decide what will be loaded into the lifeboats to survive, but there’s little evidence that the children are first. (Lucky for prisoners, federal law makes sure they are at the front of the line.) Instead, lawmakers and the governor are accusing each other of failing to save the children and the integrity of our state’s educational system Gov. Brown has proposed one solution to right the ship, but it requires the children to stay on board until the voters send help by passing his tax initiative. He seems to have overlooked the fact that children may go overboard before help can arrive — their schools must open months before the actual amount of education funding is determined. The impact of the recession and the sinking of California are wreaking havoc on the schools, as has been documented this month by reports from both the Legislative Analyst’s Office and EdSource. School districts have been left scrambling, throwing items overboard or rearranging deck chairs in a futile attempt to balance their loads. Many districts are forced to borrow funds to keep schools open when the state sends IOUs, adding to their debt burden. Since 2008, more than 40,000 teachers, counselors, nurses, librarians, bus drivers, etc. have been lost, with an additional 20,000 teachers plus thousands more school employees currently in peril. While some education bargaining units are negotiating to save themselves and their students, others seem willing to let those in third class (lower seniority) and their schoolchildren sink with the ship to save their own skins. Our schools need adequate funding to open their doors before the tax initiative-funded lifeboat can arrive. And the truth is that even if it passes, the initiative provides little more than current funding levels. Because of the uncertainty of the initiative’s passage, districts are compelled to budget with worst-case funding scenarios. As California continues to pitch in the seas of the recession, it is truly the children who will suffer the most severe, long-term damage. They’ll suffer larger classes, shorter school years, the loss of “less important” programs such as music and the arts, the disbanding of professional learning collaborations with the shuffling of remaining teachers, and so on, leaving 6.3 million schoolchildren with permanent gaps in their learning. One hundred years ago, when the Titanic sank, the world was stunned and outraged that so many lives were lost, and new, preventative measures were instituted to save lives. Years later, we are watching another ship, the public school system in California, go under. Where are the safety measures today for the schoolchildren of our state? California was already 50th in the nation for student-to-teacher ratio in 2008, and that was before education funding suffered $20 billion in losses. How much more water will we allow our schools to take on before we step in to do something? Will we be able to tell the children of California that we did everything to save them, or will we sit by idly, shrug our shoulders, and point our finger at someone else and say that it was his/her fault? Unlike the Titanic, we can stop this disaster. We must call out “children first” to save them and the future of our state. Tamara Hurley is a California native, a product of the state’s public education system, and a 24-year resident of San Diego. Trained as a scientist, she has spent the past eight years volunteering on behalf of her children’s public schools, from the classroom to PTO and PTA boards as well as on district, community, and school site committees and site governance teams. Tamara is a board member of Educate Our State, a statewide, nonprofit, parent-led, grassroots organization fighting for high-quality public K-12 education in California. Governor Brown isn’t giving up on efforts to curtail Transitional Kindergarten (TK), despite being rebuffed by both the Senate and Assembly subcommittees dealing with education funding. The May Revision budget plan, released Monday, seeks to make TK a voluntary program and use the savings to restore proposed cuts to state-funded preschool. The State Department of Finance estimates this plan would capture $132.2 million. Of that, however, $40.7 million would go to funding TK in the handful of districts that the department expects will continue or start a program, and to providing districts that lose students by opting out of TK with the mandatory one-time funding for declining enrollment. That leaves a net gain of $91.5 million. “It’s robbing Peter to pay Paul,” said Deborah Kong of Preschool California, adding that the Department of Finance savings estimates are “very questionable.” Preschool California posted an interactive map on its website showing that even though about three dozen districts are holding off on implementation of TK for now, more than 200, including Los Angeles Unified, the state’s largest district, have indicated that they’re moving forward. Transitional Kindergarten was established under SB 1381, the Kindergarten Readiness Act of 2010, introduced by State Senator Joe Simitian (D-Palo Alto). It raises the minimum age for starting kindergarten by moving up the entry date one month in each of the next three years, so by the 2014-15 school year children will have to be five years old by September 1 to enroll. The bill also created the TK program for the estimated 125,000 children who turn five during that three-month window between September 2 and December 2, and who will no longer be eligible for kindergarten. Sen. Simitian says the way TK is funded, there’s no cost to the state for the first 13 years because all the children in the new program would have been in traditional kindergarten otherwise. 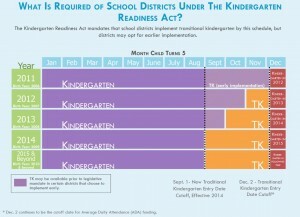 Minimum age requirements under Kindergarten Readiness Act. 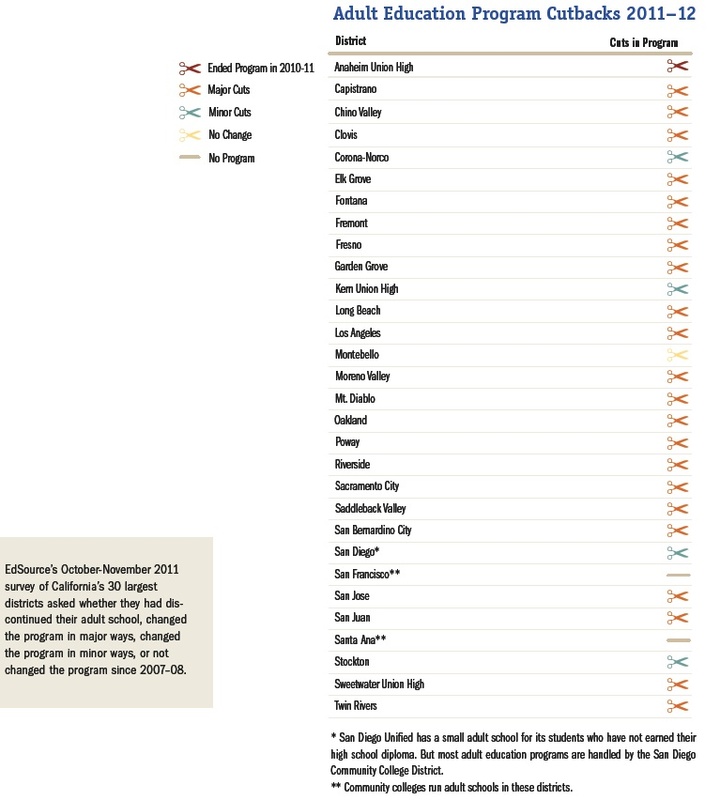 (Source: Preschool California) Click to enlarge. Lawmakers have already spoken twice on the issue: once when they approved the bill two years ago, and again last month, when the budget subcommittees in both the Senate and Assembly rejected the governor’s proposal in his January budget plan to eliminate TK. “The governor needs to understand Transitional Kindergarten is here to stay and that we stand firmly behind the Kindergarten Readiness Act,” said Assemblymember Susan Bonilla (D-Concord), chair of the Budget Subcommittee on Education that voted to protect TK. Gov. Brown's changes to TK in his May Revision budget. (Source: Calif. Dept. of Finance). Click to enlarge. Since January, however, the governor has changed the language on the trailer bill several times, and the most recent version could open TK to even more children. At the same time he proposed making it a voluntary program for school districts, Gov. Brown proposed that if those districts want to enroll children who will not turn five until sometime during the academic year when they’re admitted, the state will pay average daily attendance (ADA) funding for those students from the first day of school. Sen. Simitian’s office estimates that could potentially add another 250,000 four-year-olds to TK and cost the state tens of millions of dollars. Back in January, when Gov. Brown first recommended ending TK completely, he was going to use the savings to help pay down the more than $10 billion in school deferrals from the state. The May Revision changes that and instead would redirect the $91.5 million to state-funded, part-day preschool. The January budget called for cutting the preschool reimbursement to providers by 10 percent, raising the financial eligibility requirements, requiring parents to work full-time instead of attending college or a job-training program, and eliminating full-day preschool starting in 2013. Scott Moore of Preschool California said the idea that such a plan would save money is false for a number of reasons. One is that about half the 125,000 children who miss the cutoff for kindergarten and would go to TK instead are also eligible for state-funded preschool, so the 15,500 spots that would reopen in part-day preschool wouldn’t come close to accommodating the kids who need it. In addition, Moore says there are already more than 80,000 children on the waiting list for state-funded preschool. The political process will be different this time around. Since lawmakers have already rejected the governor’s proposal to eliminate Transitional Kindergarten, for all practical purposes, that recommendation is no longer a part of the 2012-13 budget plan. Restoring it isn’t just a matter of reconsidering that vote; it would require an entirely new proposal to end TK, and a complete turnaround by the same legislative committees that overwhelmingly killed the idea just two months ago. A few Saturdays ago, my kids and I walked through a crowd of signature gatherers for ballot initiatives outside Trader Joe’s. Some of them all but tackled me as they pitched their proposals. All of them promised more money for education and a better future for my children. Unfortunately for the signature gatherers’ bottom line, I didn’t have time to stop. My children and their school had more immediate needs. We were on our way to a Dance-A-Thon, one of many “-thons” that California parents have organized to raise money for their schools. I probably wasn’t the only parent having those thoughts. I’m sure I wasn’t the only parent who’d been hit up that morning to support an education ballot initiative. The promise of the ballot initiatives is pretty tempting for public school parents who have seen the impact of budget cuts, dipped into their pockets to pay for after-school programs, and devoted an increasing amount of family time to fundraising. After a while, you’ll sign on to anything or support anyone who promises to stop the pain. That’s what Governor Brown is counting on when his tax initiative is up for a vote in November. Still, like many Californians, the closer it gets to November, the more I’ll be thinking about that vote and what it means – just as I thought long and hard before voting in 2010 for Jerry Brown. More than anything, I want to know whether the funding will benefit my children’s high-poverty school. I want to know that the money will be targeted to restore all the supports and services that have been eliminated over the last five years. I’d like to hear whether the governor has a positive vision for improving California’s education system and closing achievement and opportunity gaps. I want to know if he truly cares about making sure all kids have great schools and effective teachers. I want to hear whether he understands the hopes and dreams of the parents and youth living in a majority-minority state and an increasingly globalized world. In all of these areas, I’m not getting many answers from our governor. When he ran in 2010, I read his education plan and believed his promises to use his long experience to bridge the partisan divide, fix California’s budget deficit, and end the use of budget gimmicks. Now, after seeing him fail to cross the partisan divide or fix the budget crisis, and watching him propose a set of budgets that include some of the worst gimmicks in state history, I’m not as trusting. This lack of trust seems warranted even when the governor appears to be doing the right thing. For example, his weighted student formula (WSF) proposal would send education funding to school districts based on student need and fix longstanding inequities between rich and poor districts. This could be beneficial for high-need schools. Yet, the governor and his advisers have failed to include basic principles of financial transparency, accountability, and school-level authority on how the dollars are spent. In practice, this means that state dollars will flow to school districts with few assurances on how they will be spent at the school level or fix funding inequities between rich and poor schools. The governor won’t even fully implement the WSF model unless his ballot initiative passes and the state has paid off other funding owed to school districts. And that brings me back to the signature gatherers. Supporters of the governor’s initiative portray it as a way to increase education funding. But when I try to figure out how this initiative is going to benefit my children’s school, I can’t tell. The only thing I have to go by is the governor’s budget, which projects over $5 billion in cuts to schools if I don’t vote for his initiative. Now, the billions in cuts to schools terrify me, but a couple of things disturb me about this approach. First, the governor has failed to provide any positive reason or offer any educational vision that would move me, as a parent, to want to vote for his initiative. Instead, he is essentially telling me and every other parent in California, “I will cut your child’s school funding if you don’t vote for my initiative.” Now, I’ve heard that the governor is delivering similar strong messages of pain to any major interest group that doesn’t back his initiative or shows interest in an alternative initiative being promoted by the philanthropist and civil rights activist Molly Munger. And maybe this will work for him. But telling me that you’re going to punish my children, their classmates, and our school if I don’t support your initiative doesn’t really work for me. In contrast, Munger provides a real vision for educational improvement. Her proposal sends the money directly to schools with additional dollars to high-need students. It requires financial transparency and stakeholder involvement in decision-making at the school level. It asks for shared sacrifice from all taxpayers. And it can tell me exactly how much additional money our Oakland school will receive in the coming years. These are the very elements that Brown’s weighted student formula proposal and ballot initiative don’t include. For parents focused on their kids and schools and advocates focused on equity, it is an attractive approach. Now that it is going to be on the ballot in November, perhaps our governor should spend less time fighting it, and more time learning from it. That would be in his best interest and certainly in the best interests of the state he was elected to govern. Arun Ramanathan is executive director of The Education Trust-West, a statewide education advocacy organization. He has served as a district administrator, research director, teacher, paraprofessional, and VISTA volunteer in California, New England, and Appalachia. He has a doctorate in educational administration and policy from the Harvard Graduate School of Education. His wife is a teacher and reading specialist and they have a child in preschool and another in a Spanish immersion elementary school in Oakland Unified. Passing a state budget that assumes voters will pass a tax increase in November is unworkable for school districts, the Legislative Analyst’s Office has concluded. Instead, the nonpartisan LAO is urging the Legislature to pass a series of measures now that would allow districts to plan for a worst case scenario, including eliminating some program mandates, extending deadlines for laying off teachers, and making an even shorter school year optional. “Although the state and districts continue to struggle with tight budgets, we believe the Legislature can take a number of actions to assist districts in managing their fiscal challenges,” the LAO wrote in presenting its third annual survey of districts and their responses to financial challenges. In order to soften the impact of budget cuts, the Legislature has given districts latitude to spend 40 categorical programs worth $4.7 billion as they want. Many have used the authority to stop funding adult education, suspend purchases of textbooks and other programs. If they had their way, 80 percent of districts would terminate some earmarked expenditures, including Economic Impact Aid, the chief source of extra money for English learners and poor kids, highly successful Partnership Academies in high school, and the Quality Education Investment Act (QEIA), extra money for some low-achieving schools championed by the California Teachers Association. Brown is proposing to permanently extend flexibility to nearly all categoricals as well, including class-size reduction, except he’d make that a key component of his finance reform, in which he would end categoricals and redirect the money to districts with English learners and poor children. The LAO qualifies its support for flexibility and for a phased-in weighted student formula. Concerned that districts might not spend money previously earmarked for disadvantaged students on those children, the LAO recommends either block grants or the adoption of restrictions until new accountability measures are put in place. Reduce the minimum school year from 175 days to 170 days and let districts decide whether to lay off staff or have a shorter year. The state would save $200 million for every day less, the LAO said. The survey revealed that 20 percent of districts have the minimum 175 days, while another 20 percent of districts have cut one to four days off the calendar. Eliminate restrictions on contracting out non-instructional services and rules requiring the hiring of substitute teachers based on seniority, at a higher pay scale. The CTA and California Federation of Teachers will fight this proposal. While most districts have adopted some furlough days for teachers and staff, only 6 percent eliminated the automatic annual salary raises, based on longevity, for teachers. Health care and benefit costs for districts rose 6 percent during this period. 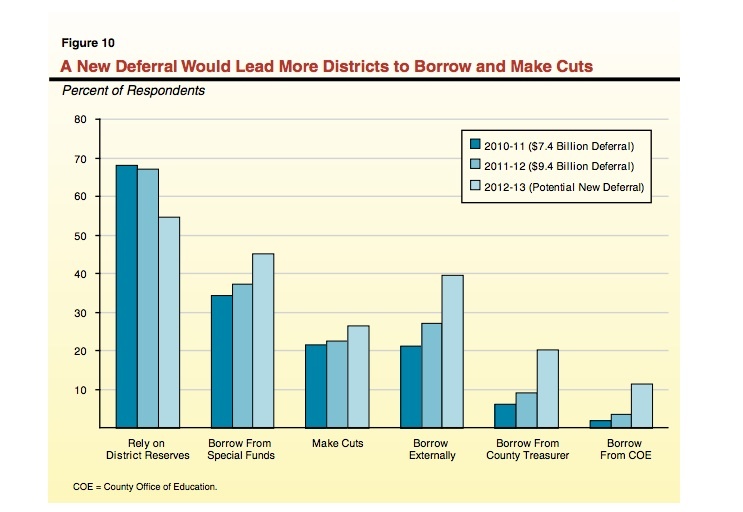 Fully a quarter of surveyed districts reported that they cannot handle additional delayed payments from the state – deferrals – without cutting staff or programs, because they no longer can borrow internally or externally, from a county office of education or a bank. Brown has proposed paying down $1.6 billion of the $9.4 billion in deferrals if the tax initiative passes, but possibly adding another multi-billion deferral if the tax plan fails. California voters give Gov. Jerry Brown low marks overall for the way he has handled K-12 education. But, at the same time, they support some school reforms that he’s championing, including directing much of new revenue to poor students, according to a Public Policy Institute of California poll. 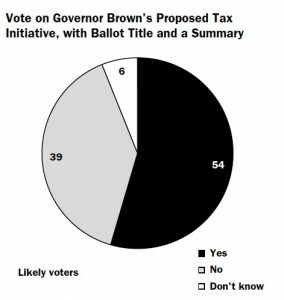 continues to support Brown’s proposed tax initiative in November, although nearly two-thirds of likely voters – and 89 percent of Democrats – back raising income taxes on the rich, the key element of the plan. What they don’t like, with only 46 percent for, 52 percent opposed, is the other piece of the proposal: raising the sales tax for schools (Brown is proposing one-quarter percent for four years). In January, 68 percent of likely voters and 72 percent of all adults told PPIC they would back taxing the rich and raising the sales tax to raise money for K-12 schools. That was before the initiative had a title and summary, which was read to poll respondents in the latest poll, so there’s no simple comparison. Nonetheless, the 14 percentage point drop, to 54 percent, is worth speculation. It could be that the complicated wording of the summary turned off some respondents, or perhaps it’s reservations after being told that only a piece of the money will go toward K-12 schools. The proposals also “guarantees funding for public safety services realigned from state to local governments” and “addresses the state’s budgetary problem by paying for other spending commitments.” Whatever the reason, Brown will face a hard sell getting the initiative passed in November. There may be a competing initiative on the ballot that would fund schools exclusively, more in tune with what voters say they want. 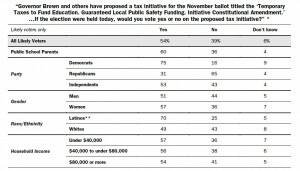 But the PPIC poll is hardly good news for civil rights attorney Molly Munger’s Our Children, Our Future initiative. It would raise an estimated $10 billion by raising the income tax for nearly all earners, and that wasn’t popular. 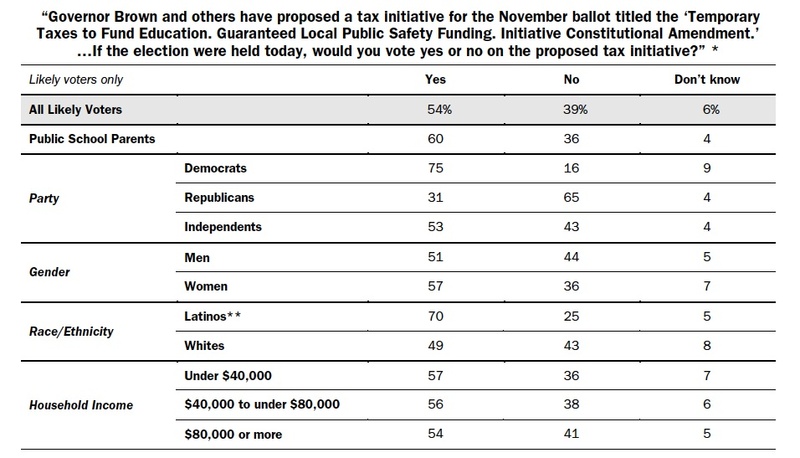 Only 40 percent of likely voters in the PPIC poll favored a general income tax increase, with 57 percent opposed. Most Democrats back it (56 percent) but only 42 percent of independents and 21 percent of Republicans. Brown can have the satisfaction of knowing Californians say he’s handling education better (27 percent approval, 23 percent among likely voters) than the Legislature (22 percent approval overall, an astounding 10 percent among likely voters). Voters could be holding the Legislature responsible for the cuts to schools: 90 percent of Californians and 92 percent of likely voters agree that the state budget situation is creating a big problem or somewhat of a problem for K-12 schools. Nearly all Californians (87 percent) believe the “quality of education” in the state is at least somewhat of a problem, with 58 percent saying it’s a big problem. That same percentage of public school parents, a subset in the survey, said they are very concerned about teacher layoffs at their child’s school. And 78 percent of all likely voters disapprove of the automatic cuts to schools that Brown is suggesting if the tax initiative fails. Brown has proposed a weighted student funding plan, a major overhaul of how schools are funded and governed. The poll doesn’t ask about that per se, but the survey did ask about the key elements of the plan. For the most part, Californians approve of them, in concept. Flexibility and local control: More than four out of five Californians (82 percent) want local control of school spending decisions, either within school districts (48 percent) or at the school level (34 percent). Likely voters are even stronger on the issue: 53 percent want decisions at the district level and 36 percent at the school site. The one region where this is less so is Los Angeles, where only 40 percent want decisions made by the district; 21 percent (twice the state average) would prefer power to remain in Sacramento. That sign of lack of faith locally should be a warning to the Los Angeles Unified School Board, which is proposing a $298 parcel tax in November. Targeted funding for poor students: Brown would funnel significant portions of new dollars to low-income students and English learners. Californians strongly support helping the former, less so for English learners, reflecting ambivalence toward illegal immigration. Most Californians (82 percent) believe that school districts in lower-income areas of the state have fewer resources than school districts in wealthier areas, according to the poll. More than two-thirds (68 percent) of Californians say districts with high proportions of poor children should get a bigger share of new funding. But only about half (52 percent) say more money should go to English learners. (Since about three-quarters of English learners are also poor, we’re talking about roughly the same children.) For likely voters, the level of support drops to 54 percent for the poor and only 40 percent for English learners. Democrats provide the largest support across the board. If a school construction bond were on the local ballot, 62 percent of residents 53 percent of likely voters say they would vote yes ; it takes 55 percent for passage. If a parcel tax to supplement funding of local schools were on the ballot, 60 percent of Californians and 51 percent of likely voters would support it – about the same level of support as in past years. It takes a 66 percent majority to pass one. Parcel taxes are regressive since the tax is the same, regardless of the value of the property. Support is about even across regions, although most parcel taxes have been approved by voters in Bay Area school districts. Latinos (72 percent) and Asians (65 percent), younger Californians, those without a high school diploma, renters and those with household incomes less than $40,000 indicate the most support for a parcel tax.